I'm not entirely sure why I did this - but there we are. 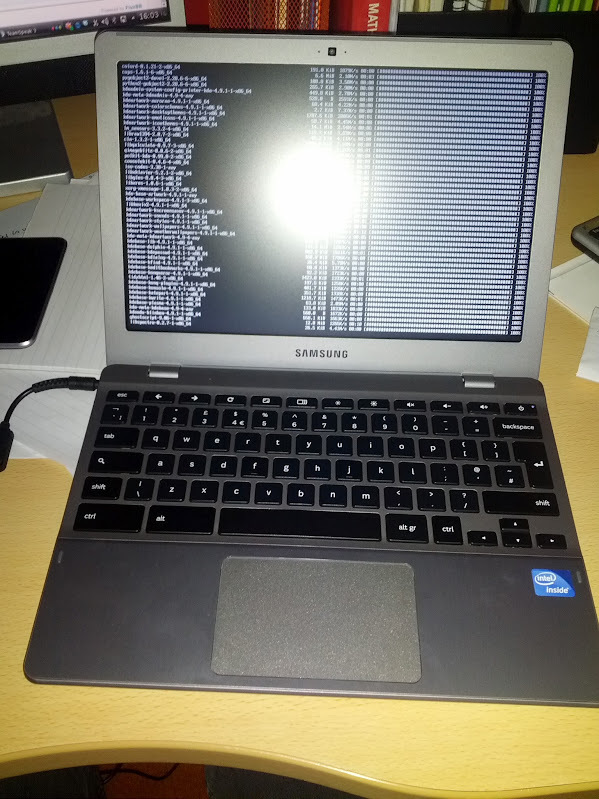 I've successfully installed Arch on a Samsung Series 5 550 Chromebook! Red text indicates Chromebook steps. Blue text indicates "host PC" steps. Green text indicates "Arch VM under host PC" steps. Make sure you know what you're doing. This isn't for the faint-hearted. Firstly, you need to enable the developer-mode switch on your Chromebook. This will wipe all stored persistent data! It's hidden inside the Kensington lock space and can be switched with a toothpick or paperclip. Boot your Chromebook to the initial setup screen and set up networking on the first page, then stop. Use the script from the Ubuntu on CR-48 blog to repartition your Chromebook's internal storage. This will reboot your Chromebook. Remember how large you made your new Linux partition! Again, boot your Chromebook to the initial setup screen and set up networking on the first page, then press Ctrl-(->) again, and login as chronos, then sudo -i. On your host PC, install VirtualBox and download the latest Arch installation media. Copy /usr/bin/cgpt onto a memory stick, or scp it directly to your host system. On the Samsung Series 5 550, it's a 64-bit static binary. Calculate how much (number of Linux gigabytes) * 1024 * 1024 * 2 is and substitute LINBYTES in all following instructions for that number. Launch VirtualBox, configure a 4GB-RAM virtual machine with the first SATA drive as arch_disk.vdi and the CD-ROM drive pointed at the ISO you downloaded earlier. Install Arch onto /dev/sda inside the VM. Make sure that you use /dev/sda7 in the fstab and not /dev/sda1! Shutdown the VM and close VirtualBox. Get the arch_rootfs.bin onto the Chromebook somehow. I suggest a USB memory stick. If this says /dev/sda3, substitute 2 for CRKERNEL in the following commands. If this says /dev/sda5, substitute 4 for CRKERNEL. If it says anything else, panic. Now you can reboot your Chromebook and you should boot into Arch! Note that rebooting after this will boot back into ChromeOS, as Arch does not set the "successful boot" flag on the kernel partition. So you managed to install it, but how does it run? Is everything working or do some parts not work? I believe everything should have an OS driver, and I know that Xorg works. Click thumbnails to view full-size imagery. Working on getting KDE up and running, but I accidentally resized my Arch partition to 0 bytes and broke the entire partition table. Gives me a chance to revalidate my instructions, I suppose! I'm pretty interested in this, keep us posted! The Chromebook does actually have F1-F12 buttons - they just have the Chrome imagery on top, so it's Back Arrow, Forward Arrow, Refresh Circle, Maximize, Tab Switcher, Dim Brightness, Increase Brightness, Mute, Volume Down, Volume Up and they all appear to the software as F1-F12. Great! Thanks for these instructions. In fact I already have an ubuntu installed... do you think I can start at step 10? Another question, do you think it is possible to pass root=/dev/sdb1 for instance, so that the rootfs will be on a usb stick? You should make this a wiki page... good info here. Obviously this also applies to changing any other kernel parameters. in my user's ~/.bash_profile so that when I'm logged in to CrOS, Arch is just a Ctrl-Shift-T (opens crosh), "shell" (opens bash), "archboot" and then my root password away. Both Arch and CrOS have very minimal bootup times, so this serves me well. Obviously hitting Ctrl-D on every boot to clear the Sad Chromebook is a bit annoying, but not too bad. The beep still surprises me sometimes if I forget! In fact I had an ubuntu already installed. I then used the method explained above to switch to systemd booting. Everything seems supported, I have a kernel 3.4 running, fuse filesystem is supported, video accelerations sems to work in xbmc. Thanks very much for this, i'm going to give this an attempt tonight on identical hardware (series 5 550). I did exactly as cyberic - I installed ubuntu via the script, then installed arch on a VM, then tar'd up the rootfs and untar'd it onto my ubuntu filesystem (mounted via chromeos). I then copied the old /etc/fstab and /lib/modules to my extracted arch system, rebooted and it works! I was able to compile some modules for the kernel. Does anyone know where I could build/have the cgpt program? 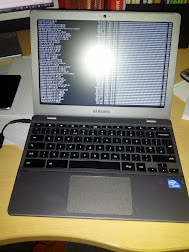 I failed to back it up properly before installing Arch on my Samsung 550. Also, everything works except for wake from suspend. I will likely start another thread for that. Can't you mount the chrome os partition anymore? Actually, I just downloaded a chromeos image and copied it from there - was literally coming on here to update. for some reason GDM says "Invalid UTF-8" when I try and login... autologin works fine, though. This isn't huge and I will eventually figure it out. My big problem is: suspend works, but when I try and wake the machine up it just boots Arch normally (as in, i see the sick chromebook and have to hit ctrl+d). Are you able to suspend properly? I have a chromebox, not a chromebook. Has anyone attempted to get this to work on a C7 chromebook? One of the $199 x86 ones? If so, could they tell me how? The cgpt returns an error and is not a 64-bit ELF, rather 32-bit, so I think this may have something to do with it. You can use the script here to partition the drive (or boot from an SD card!). It installs Ubuntu but you can do what cyberic and I did and just replace it with Arch. Does anyone have the ability to provide me with a KERN-A & KERN-B image? I tried pm'ing cyberic but I'm not sure if it went through. I can dump the A and B partitions if you want. Could you remind me of which partition number they correspond? Just to let you know that I have compiled a kernel with kexec enabled. I succeeded in loading kernels compiled from chromeos-3.4 branch, but when I tried to kexec a 3.6 arch kernel, it failed. 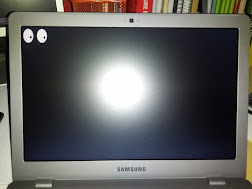 Does anyone has info on google patches required to boot a kernel on a samsung chromebox/chromebook? I compiled mine from here if you haven't seen it yet. I solved my problems by enabling vga arbitration. It was required for the new kernel to boot correctly.